Lady Antebellum – Entertainment Ave! You might think Lady Antebellum, after four albums, would begin to lose their ability to stay fresh and shift a little into “resting on our laurels” mode, as well as that sometimes cookie-cutter, hit-manufacturing process some artists will drift. You would be wrong. 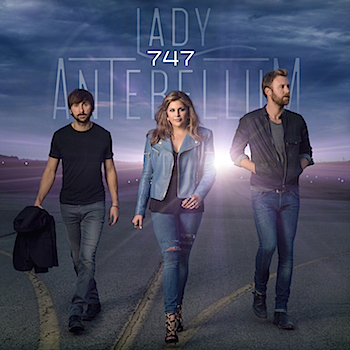 Their fifth studio album, “747”, is as fresh as ever, contains a number of songs that keep getting stuck in my head, and though not perfect shows that the trio of Hillary Scott, Charles Kelley, and Dave Haywood aren’t about to just take the safe route with manufactured, radio-friendliness, and a “Whoa oh” thrown into a song for good measure. If you’re a country fan you’ve undoubtedly heard “Bartender.” It’s been all over the country charts hitting the top spot easily with sing-a-long goodness and the fact that the girl is “comin’ in hot.” “Bartender” shows a little where most of the album is going, at least theme wise, with a lot of love is over (Bartender), missing love (Damn You Seventeen), realizing you’re just being used in love (Just a Girl, with the line “cuz I’m always your consolation prize”), and hoping love doesn’t fall apart (the barreling-through-the-skies title track, 747, “she gets a little bit closer to saying ‘Goodbye’” and the ever catchy “This 747 can’t go fast enough.”). Though “Freestyle” isn’t my favorite track on the album, I will give credit with throwing in a nice Matthew McConaughey “All right, all right” reference, and “Lie With Me” kind of just floats out there for me, which I feel a little bad writing because in their press release it mentions Hillary Scott having high hopes for the song. I do understand the story of it and see the scene of the song play out, but it just doesn’t stick with me. I don’t find myself hitting the fast forward button on either of them either, though, so maybe they are continuing to grow on me. While stretching their wings a little bit and trying a few new things, especially an album mostly of up-tempo, foot-stomping fun, I don’t think Lady Antebellum is drifting too far from their harmonious sounds to upset anyone in their fan-base. An album like 747, in fact, keeps them sounding fresh so it’s not just a collection of “That sounds just like…” album. I will say when “Bartender” was on the radio I would eventually find the song stuck in my head at odd hours of the day. After listening to 747 the trio of “Damn You Seventeen,” “747,” and “One Great Mystery” have taken over, on a shuffle loop, invading my shower time, waking time, and just sitting around time. With that I’m thinking there are probably a few more hits destined for the radio from the album. 747 is Lady Antebellum goodness and 91% on the Entertainment Ave! Listenability scale. Whoa yea!